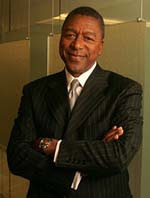 Bob Johnson explained what Hillary meant with her Dr. Martin Luther King comment and had an ambiguous message for Obama. Some people think he is refering to Barack’s pass drug usage when he mentions, “and I won’t say what he was doing, but he said it in the book”. I am just happy we have a black candidate as well as a female Presidential candidate.